A pigment is a dry, powdery substance that must be mixed with a liquid like water to leave behind black, white or color. We don't need to get too detailed in the science of pigment ink, but it will suffice to say that the pigment is not necessarily water soluble, but it may remain suspended in the liquid (much as is the case for a “colloid"). So what are the advantages of using pigment ink? 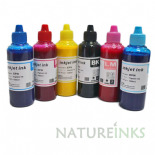 Pigment particles tend to bond to edges within the chosen medium, a reason why these inks tend to last longer and resist fading over time.